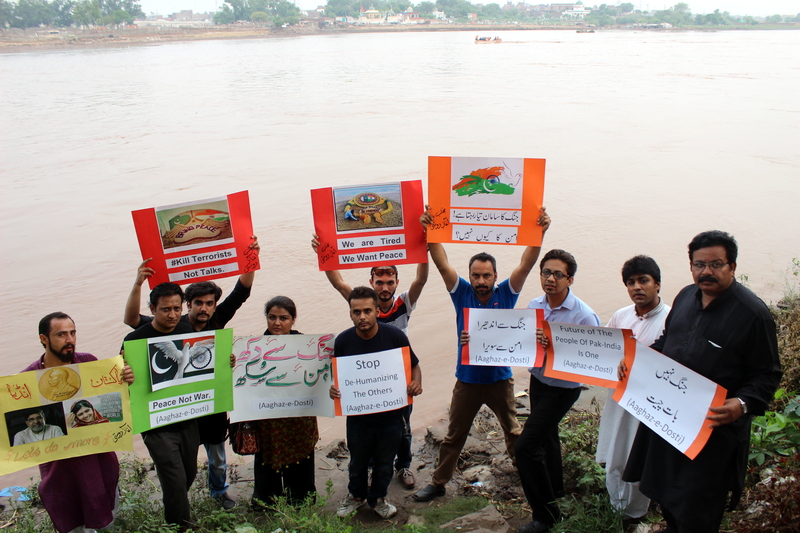 Despite being a voluntary and unfunded initiative, Aaghaz-e-Dosti has been able to be a consistent voice and platform working for Indo-Pak peace since May 2012. Aaghaz-e-Dosti was started by some individuals led by Ravi Nitesh of Mission Bhartiyam in India in 2012. For Aaghaz-e-Dosti, Mission Bhartiyam had collaborated with several organisations of Pakistan (such as CYDA, IMOV, The Catalyst, The Catalyst for Peace) in the past and from May 2017, Aaghaz-e-Dosti became a joint initiative of Mission Bhartiyam and Pakistan-based Hum Sab Aik Hai (lit. “We are One”). Aaghaz-e-Dosti (lit. Beginning of Friendship) was initiated by Mission Bhartiyam in 2012. At present, it is a joint project of Mission Bhartiyam of India and Hum Sab Aik Hai of Pakistan. The working structure of Aaghaz-e-Dosti consists of founder, two convenors (temporary post) – India and Pakistan, core committee members, city-coordinators, members of regional team and task-based committees. 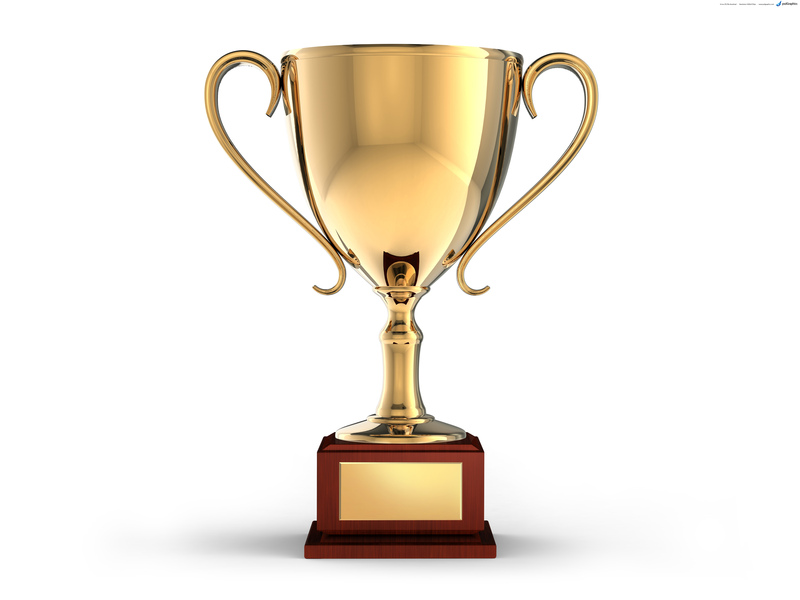 Volunteers: While anyone can apply to become a volunteer, only those who work are recognised as volunteers and on the basis of their work, are given a responsibility and enrolled in the team. 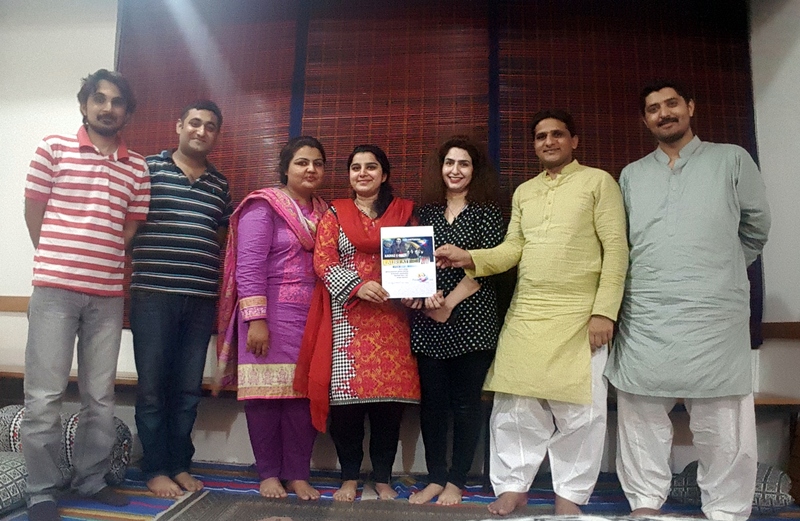 Chandigarh, India: Aaghaz-e-Dosti, a voluntary and non-political Indo-Pak cross border friendship initiative launched its 5th Indo-Pak Peace Calendar in Chandigarh on 18 February at St’ Stephens School. The calendar was launched by Smt. Asha Jaswal, Mayor, Municipal Corporation, Chandigarh; Dr. DNV Kumara Guru, Director – External Relations and Human Resources at Indian School of Business, Mohali, Punjab; Mr. Sandeep Joshi, Cartoonist, The Tribune Group; Mr. Avtar Singh, Director – People’s Convention Centre; Mr. Louis Lopez, Principal, St. Stephen’s School, Chandigarh; Mr. Pramod Sharma, Director – Yuvsatta and Shruti Achesh, member Aaghaz-e-dosti. The Launch program was organised at St. Stephen’s School by Yuvsatta, a Chandigarh based youth empowering NGO, who is also one of the collaborators of the Aaghaz-e-dosti Indo-Pak Peace Calendar this year. The program was attended by majority of the students of the school along with the school Principal, Vice Principal, teachers and the staff members. Besides the Launch, the esteemed guests also presented their views regarding Indo-Pak issues and the value of developing friendly relations with the neighbouring countries. The Aaghaz-e-dosti Indo Pak peace calendar features selected paintings (6 paintings from India and 6 from Pakistan) from schools students (Grade 8 to 12) of India and Pakistan. These Paintings depict an innocent and apolitical horizon of peace. This year, we received thought-provoking expressions from students of several cities in India (Bulandshahr, Cuttack, Dehradun, Delhi, Jammu and Kashmir, Kolkata, Lucknow, Mumbai, Surat and Vadodara) and in Pakistan (Karachi, Lahore, Swabi and Toba Tek Singh). Along with the paintings, peace calendar includes messages from peace activists and renowned intellectuals. This year, Peace calendar includes messages of Dr. Salima Hashmi, Dr I A Rehman, Prof. Ishtiaq Ahmed, Lt. General (Retd) Muhammad Masood Aslam from Pakistan and Dr Shashi Tharoor, Col (retd) Virender Sahai, Major General (retd) Ashok Mehta, Sudheendra Kulkarni , Dr Syeda Hameed from India. Speaking on the occasion, Mr. Louis Lopez, Principal St. Stephen’s School congratulated Aaghaz-e-dosti for taking this thought forward to initiate Peace between the two nations. He talked about the role of students in peacebuilding and how the noble values of peace and non violence can lead our country and can contribute in developing a peaceful and more humane environment in the world. 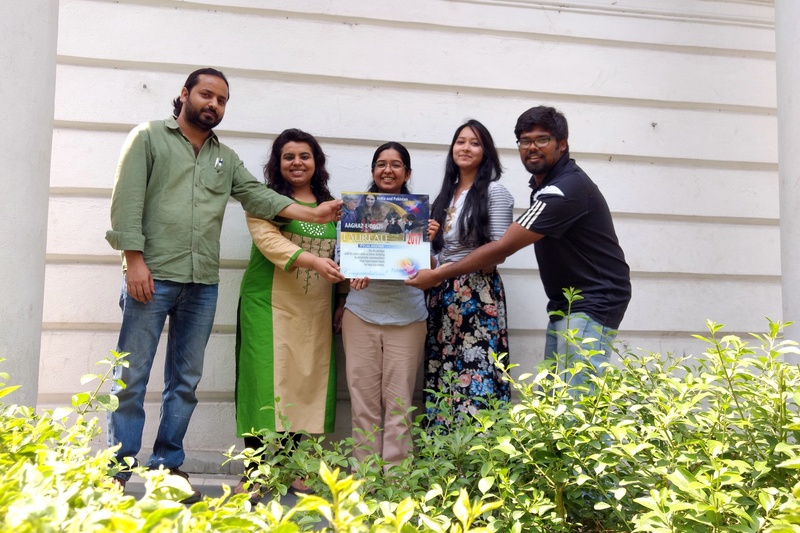 Shruti Achesh, who is a member of the Aaghaz-e-Dosti team, Delhi, gave an introduction on the vision and mission of the initiative and, how this peace calendar is helping to bridge distances between the people of India and Pakistan. She said that both countries have a history and geography shared together and in no way both can even think about being a rival of each other. She described how common people as well as children of both the countries are eager to develop friendly relations and are doing efforts to achieve that. She recited examples when during classroom connects of Aaghaz-e-Dosti, students from both sides became so happy while talking to each other and started inviting each other to their home immediately. Chief Guest Smt. Asha Jaswal said that Indo-Pak relations is one area where we need more and more people to work for.. And the best people who can contribute towards this initiative is the youth of both the nations and everyone should support them. She also congratulated Aaghaz-e-Dosti for initiating this process of people to people contact and emphasized on the point that no one wants war, everyone wants to live in peace with each other and, if Aaghaz-e-dosti has taken this initiative to bring this forward, then everyone should encourage them by themselves being a part of this process. She also told that there are lot of efforts being done to normalise the relations through increased role of people to people communication and it needs to be developed more and more. Mr. DNV Kumara Guru who is the Director – External Relations and Human Resources at Indian School of Business said, there are much deeper bonds of love and friendship between the people of India and Pakistan and we should continue making efforts to strengthen these bonds, to build bridges and to remove all kinds of barriers that divide us. He said we all are peace loving human beings and it is our responsibility to break this rhetoric to foster harmony, love and the importance of togetherness. Mr. Sandeep Joshi, who is a cartoonist with the Tribune Group stressed on the importance of art in bridging the gap between the two nations. He further added that art accepts no boundries and can be one of the ways in which we can create a momentum for peace between India and Pakistan. 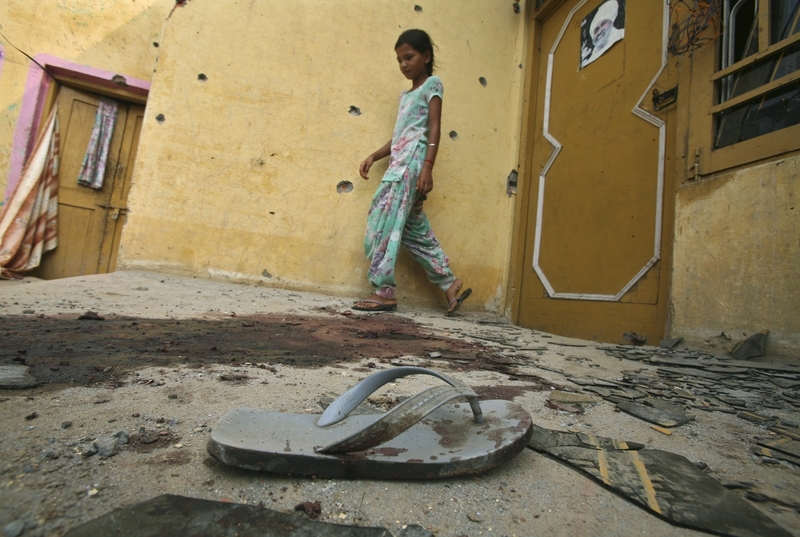 Pramod Sharma, Director and Coordinator – Yuvsatta told that he has had many experiences through his travel to Pakistan and he has found that people on both sides of the border are same. He also talked about the Global Youth Peace Festival that is organised by his esteemed organisation every year in Chandigarh, and where they are trying to promote the process of building peaceful ties by inviting and encouraging the youth from different parts of the world. 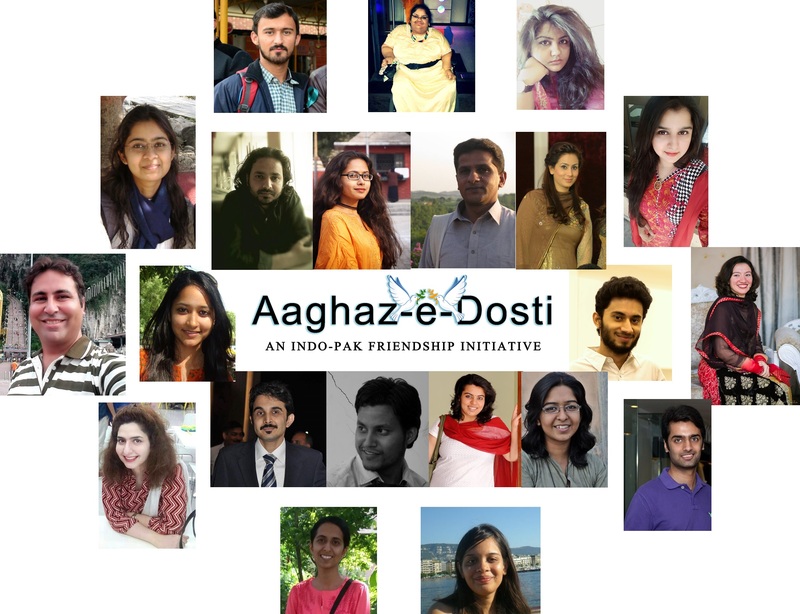 Running since last 5 years and, presently with a vibrant team of youth coordinators along with more than 15 chapters in both Pakistan and India, Aaghaz-e-Dosti aims to create unwavering bonds of Peace and friendship between these two nations by strengthening people to people contact. Aaghaz-e-Dosti is heading towards its objective through various activities such as Aman Chaupals, Peace Workshops, Classroom to Classroom connects, Indo-Pak Peace Calendar, Discussions and Seminars and others. Aaghaz-e-Dosti is one of the most prominent voice on Indo-Pak issues and has been recognized for its voluntary efforts by people, media and governments on both sides of the border along with many awards from organizations and peace institutions. This year, calendar has been launched in presence of various dignitaries in Lahore (1 Jan), Toba Tek Singh (8 Jan), Peshawar (9 Jan), Karachi (29 Jan) in Pakistan and New Delhi (14 Jan) Mumbai (30 Jan), Dehradun (5th Feb), Panipat (11th Feb) and Kolkata (5 March) in India. The Calendar has also been launched in Kyrgz Republic.